Last week I told you about the Punta della Dogana, and in that description, I mentioned the 'sestiere' of Venice, and I promised to explain what they are about. The word 'sestiere means 'district' in English. In Venice, there are 6 such districts, or sestiere. Here is a map of the six sestiere. If you count the colors and names, above, you will actually see seven districts. This is because the Giudecca along the bottom of the map, though technically one of the districts, is not traditionally counted among those of Venice, proper. Nor is the Lido, which would be still lower on the map if it was displayed. And there are many other area of the Venetian lagoon which are not counted in the sestiere, like Murano and Burano. The 'ferro' of this gondola has representations of the sestiere of Venice. The six rectangular bars protruding to the left represent each sestiere, while the one aimed to the right represents the afore-mentioned Giudecca. The other, fancier protuberances to the left? Unofficial embellishments by the owner. Each of these districts has its own charms -- some more popular than others, and thus, some are much, much more crowded. But if you want to be where the action is...where the main attractions sit, you may well want to find lodging within these popular sestiere. Here's the thing: many of the tourists who descend on Venice during the day are not actually staying on the Venetian island, and most vanish around 5pm each afternoon to catch a bus back to the mainland. Every once in a while, I'll tell you more about a particular sestiere, in order of my personal preference for visiting. Today, I give you the sestiere of San Marco. In this photo, I'll put some focus on the sestiere of San Marco. This photo gives you an idea of the true size of Venice. Though San Marco is one of the smallest of the sestiere, you can see in the photo below that there are many, many buildings in its warrens. For you, that means that there is much to explore! The sestiere of San Marco is chock-a-block full of marvelous sites, restaurants and hotels. First and foremost is the Piazza San Marco (the most obvious area of the photo, above), where you will find, besides the huge piazza itself, the Basilica San Marco and the Doge's Palace. The Museo Correr, within one of the buildings which form the piazza, is an excellent way for you to find out about the ancient town where you now find yourself. A side note regarding the Piazza San Marco: there is only one 'piazza' within Venice, given the moniker because of its size; the rest of the public open areas are called either a 'campo' or a 'piazzetta'. San Marco is also where the beautifully-restored La Fenice opera house is located. Also in San Marco are the large campi of Santo Stefano and Sant'Angelo, which can be seen within the bend of the Grand Canal to the left of the photo. Shopping? My gosh but there is a lot to buy within the confines of San Marco. From trinkets and hand-fashioned glass, to designer labels of every sort. My wife, Ellen, has twice purchased frames for her eyeglasses within San Marco. Here is a pair, though, that she did not buy! The two main shopping streets are Calle Larga Ventidue Marzo, which connects the Piazza San Marco with Campo Santo Stefano, and the interlinked Merceria San Zulian and Merceria Orologio, which lead from the Rialto Bridge to Piazza San Marco. So, San Marco is where the action is. If you visit Venice and do not travel to San Marco, you really haven't been to Venice, at all. In the photo below, all of what you see along the water in this photo is within the district of San Marco. 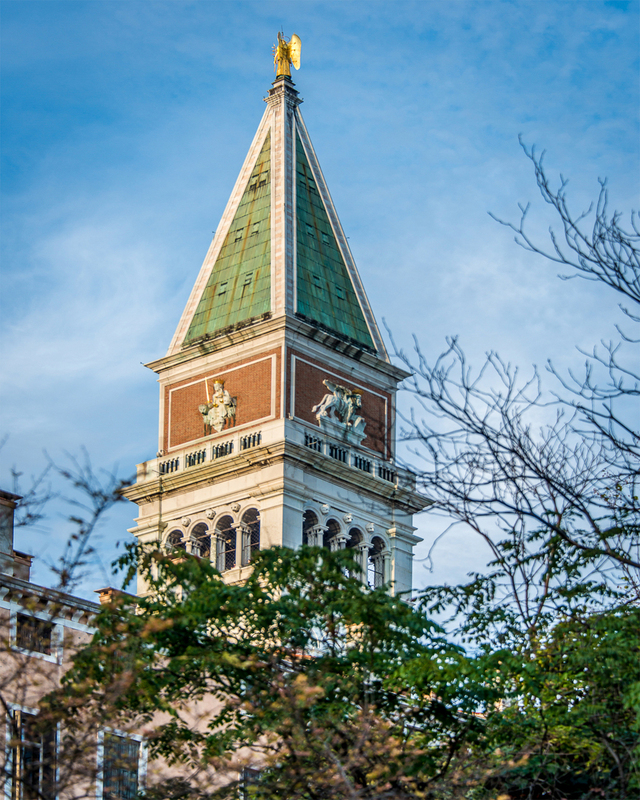 Here are a few photos that I've taken within San Marco's boundaries. And here is the Piazza San Marco, which Napoleon dubbed 'Europe's Drawing Room'. 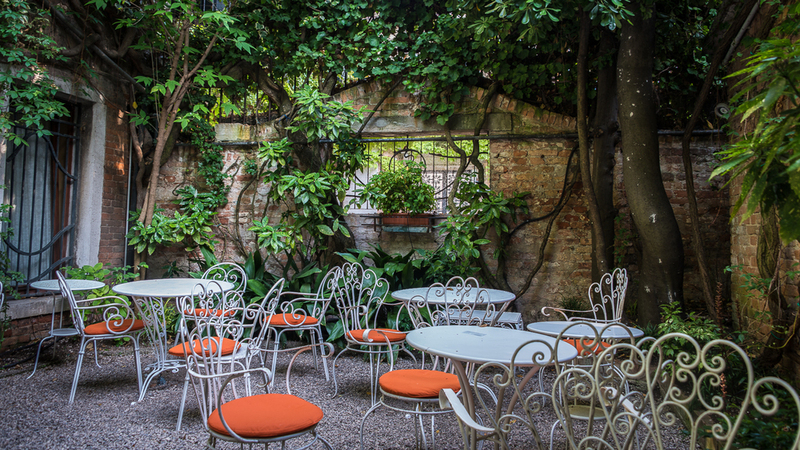 Our favorite place to stay in San Marco is the Hotel Flora. 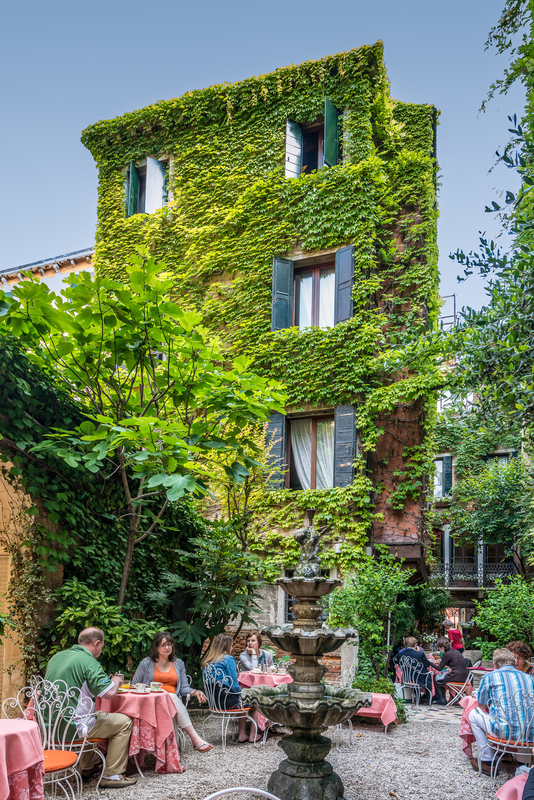 This hotel is an oasis of tranquility withing the hubbub of San Marco. Here are a couple of photos of this quaint hotel. The windows at the top of the hotel...ours. Our favorite San Marco restaurant? That would be Antico Martini. This excellent restaurant has been in continuous operation since 1720. Here are a couple of photos of Antico Martini, both current and very old. So, that's the sestiere of San Marco. If you go to Venice, you need to spend at least one-whole day in this essential district. Want to see some of the out of the way places? I'll take you there.